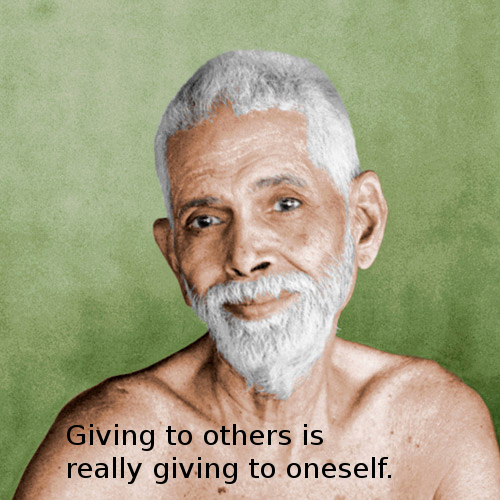 Bhagavan repeats this idea many times in his works and answers to devotees and says, “All that one gives to others one gives to one’s self. If this truth is understood who will not give to others?” from Bhagavan in the classic “Who Am I?” Answer to question 14. This is a recurring and a central theme in Bhagavan’s teachings. Since the same Self animates all beings, what we give to others, we are really giving to our own Self. Bhagavan teaches that All are the Self, but they don’t realize it. However, a Sage treats everyone as the Same Divine Self whether they yet know it or not. Bhagavan exemplified this in relationship to all living beings including people, animals, birds, and plants. Because All Is One, the Sage naturally follows the path of Ahimsa (nonviolence) and becomes a friend of all life in various forms. Truly this beautiful quote is for reflection and meditation on the nature of the Self. According to Eastern spiritual traditions (Hinduism, Buddhism, Jainism), our action and motivations generate subtle forces that not only affect others but affect us as well. Our actions influence our personality and character and hence our destiny. Therefore, Bhagavan says that it is best to surrender all fruits of action to the Lord. Bhagavan’s teachings are beautiful because Bhagavan reduces seemingly complex theories of enlightenment and the spiritual path to simple and straight forward practical instructions. “All that one gives to others one gives to one’s self. If this truth is understood who will not give to others?” from Bhagavan in the classic “Who Am I?” Please read on – and thank you, Harsh Luthar, for sharing this powerful wisdom with all of us. How different this world would be if we only remembered these wise words! Thank you for this reminder…Cheers.